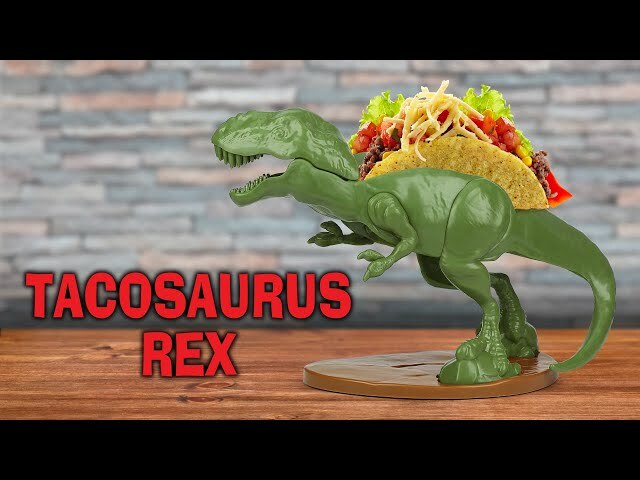 Tacosaurus Rex Taco Holder has been added to your shopping cart! "Keep your tacos safe? You bet Jurassican." - Tacosaurus Rex Taco Holder If you're pterotorial about your tacos our is just the lizard king for the job! If you're pterotorial about your tacos our Tacosaurus Rex Taco Holder is just the lizard king for the job! Now the hunted becomes the hunter! Keep this fiercely loyal tyrannosaurus rex fed with yummy noms, and he'll be raptor round your finger! And while he's best know for defending your tacos, he also enjoys a good BLT - bacon, lettuce, tyrannosaurus rex! THE ULTIMATE TACO HOLDER: Tacosaurus Rex Taco Holder. Holds 2 Tacos! NOT JUST FOR TACOS: Try it with Waffles, Toast, Sandwiches, Ice Cream Tacos, Crackers and more! FUN FOR ALL AGES: Perfect for kids and adults that are looking to add a bit of fun to the dinner table! FOOD-SAFE: BPA free, lead free and phthalate free. EASY TO CLEAN: Top rack dishwasher safe. Not microwaveable. Watch with delight as our Tacosaurus Rex turns your little monsters into content and docile critters. This prehistoric titan carries two tacos and makes every meal a thrilling adventure! This 100-percent food-safe polypropylene taco holder can handle just about anything young children do to them. It's the ultimate gift for dinosaur lovers! BPA free, lead free and phthalate free to meet or exceed current safety standards. Dimensions: 9.5 inches tall x 4.5 inches wide x 6 inches long. Our Tacosaurus Rex Taco Holder is dinomite! Thinking about giving a boring gift? Check yourself before your rex yourself.